Hello and welcome to my Sunday posting; today was my Eastern Palace Stamp-a-Stack so I’m sharing all things Eastern Palace with you tonight. This suite was one I didn’t think I’d like. It looks complicated, fiddly and totally not my style. So of course I purchased it, to push me outside my comfort zone, and I’ve fallen in love! Wow I didn’t see that one coming. It also uses 3 of the new In Colours for 2017 – 2019 in the papers, matched with Gold foiled sheets and the vinyl stickers which are just amazing to use and look really gorgeous! The Premier Bundle is ONLY available this month includes all of the above, plus full size ink pads in 3 of the new In Colours; Fresh Fig, Tranquil Tide and Lemon Lime Twist. As an added bonus you will get a pack of Thick Very Vanilla cardstock and envelopes totally FREE! Buy Your Premier Bundle Now – Click here to purchase. A Stamp-a-Stack is where you stamp up a stack of cards in one go. Today we made 9 cards using Eastern Palace alone. The dies are very clever, you can combine them into multiple combinations. The stamps are the same with some beautiful results even if you’re not 100% perfect with your stamping. I love that the patterns do not require you to stamp perfectly, which takes the stress out of the project completely. If those little squiggles or circles are not absolutely lined up, it doesn’t matter because it still looks amazing! How cool is that? If you’d like to replicate the cards made in the Eastern Palace Stamp-a-Stack then purchase the Premier Bundle, Dapper Denim Ink and some Natural Gold Trim. Remember you get the Very Vanilla Thick Cardstock and Envelopes FREE with the Premier Bundle. This bundle will NOT be available after 31st May, the Eastern Palace suite will be available in the new Annual Catalogue, but no FREE items will be included if you purchase them separately. 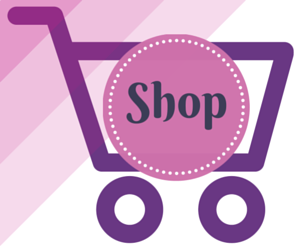 You can also get the Premier Bundle as part of the Starter Kit if you join Stampin’ Up! this month! Join my team now – click this link. Find out more about my team and joining here. Add to your Starter Kit – Click here to join. 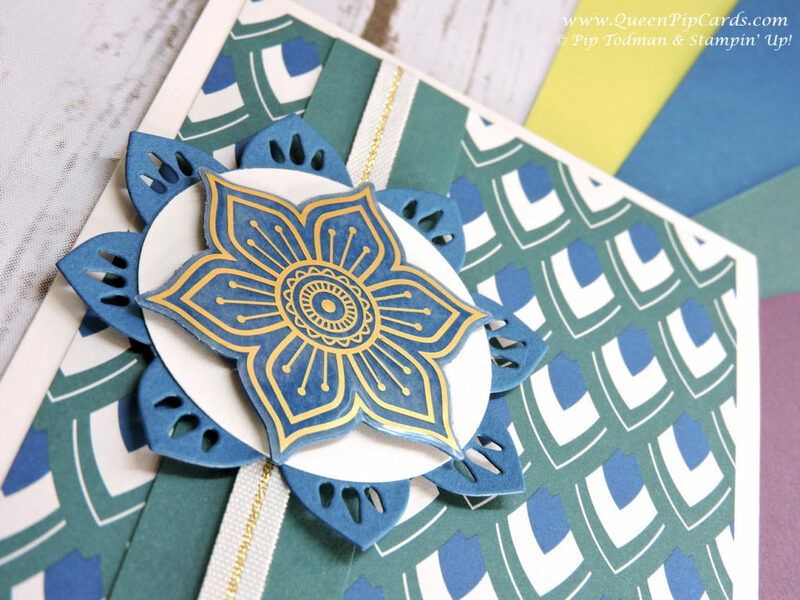 I hope I’ve inspired you to get going with Eastern Palace today! 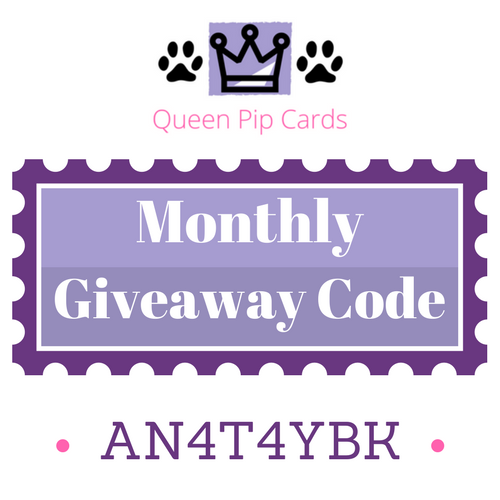 Don’t forget to use the Monthly Giveaway Host Code (see below) today when you shop to receive a FREE pack of the new embellishments from me as an added thank you in June! 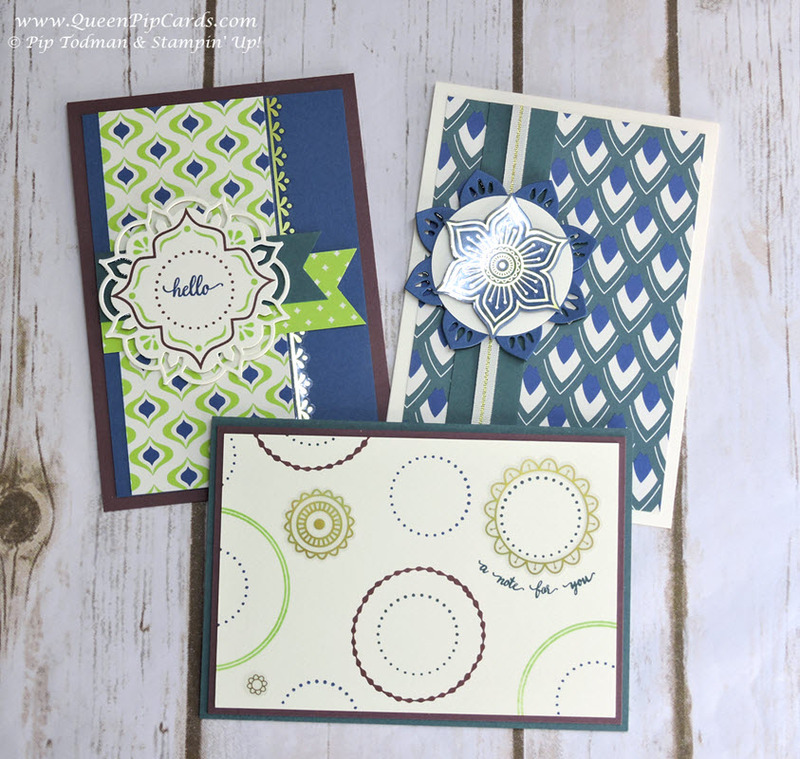 « Say Hello To The New In Colours From Stampin’ Up! Thanks Christine! Yes I love them and the new in colours! I can’t wait to get my hands on these to layer them up too. I just love the new In-Color palette.